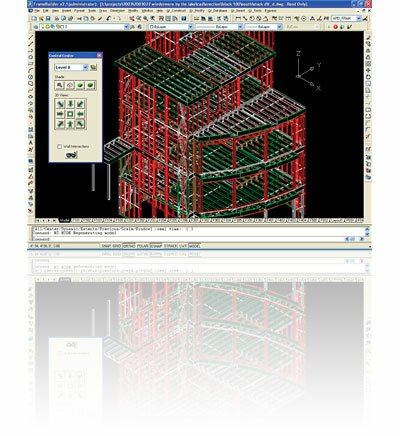 FrameBuilder is a structural design software application that produces all of the necessary data, drawing and instructions required to build light steel structures. This technology greatly reduces the hours of labor required for engineering design and fabrication. By utilizing the power of this design data in advance of construction areas of material reduction and on-site installation details can be identified, which together are the primary costs of providing light-steel structures. Built on the AutoCAD platform FrameBuilder provides an industry standard interface, with industry specific tools such as Model Validation that accurately identifies key areas of LSF building design providing a complete building model. Its proprietary database and simple set-up screens allow the parametric model to be quickly configured per region or per job. FrameBuilder generates all the required outputs in order to manufacture. This includes precisely formatted fabrication drawings, along with detailed material exports in a format that integrate seamlessly into our Manufacturing & Operations enterprise management system.